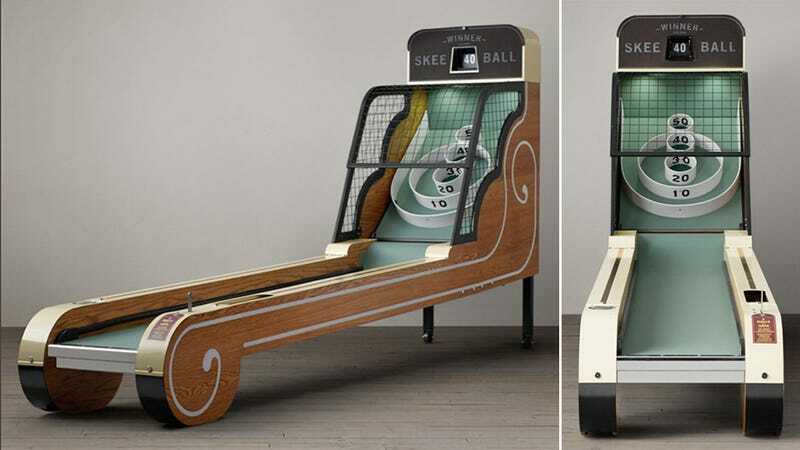 If you're as enamored with this gorgeous vintage skeeball game as we are, finding space for it in your home won't be a problem. Because you'll happily ditch your dining room table, your living room sofa, even your bed to make room for this piece. It basically turns your home into your own private Chuck E. Cheese's minus the screaming kids and disgusting layer of grease. So what does $7,000 get you here? A 1930s-era cabinet made from hand-finished oak that's been outfitted inside with modern electronics and wiring. However, it still retains a classic flip-style display scoreboard, a pull-handle activation lever, and five polished balls ready to launch up the runway.